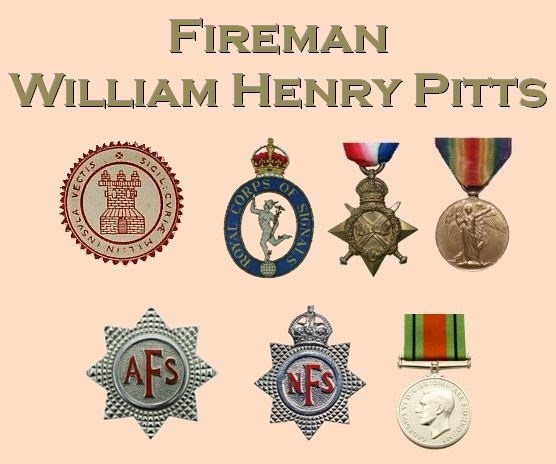 Fireman William Henry Pitts passed away on 10 October 1964 aged 67. William was born at The Curragh army camp in County Kildare, Ireland, in 1897. He was the eldest of six biological children of George and Emily listed in the 1901 Census by which time his 43 year old father, from Earley in Berkshire, was listed as an army pensioner. Accordingly the birthplaces of his five younger siblings suggest a number of different postings at different times in Aldershot, Portsmouth and Woolwich. William also had an elder sister by adoption, Edith May Patrick, also from Aldershot. William served in the latter stages of the First World War with the Royal Signals. Between the wars he spent time working in both engineering and taxi driving. In 1924 he married Edna Mary Fanny Jenkins (from Binstead) at the Register Office in Newport; it is believed they had two sons, Alan Anthony 1928 and David Keith in the following year. When the clouds of war began gathering he volunteered to join the Auxiliary Fire Service but his mechanical skills were found more useful when the National Fire Service was formed and he served in the NFS engineering departments at both Newport and Sandown (it is believed that he remained a part-time fireman between his shifts at the service workshops). After the war the family relocated to Northamptonshire where he again worked in engineering before returning to Ventnor two years before his death. His funeral service was held five days after his death at Saint Alban's in Godshill and was attended by many who knew him and a strong contingent from Ventnor Fire Station. Cremation followed at Whippingham. Rest in peace Fireman Pitts.